Andere Frauen, a film made in Vienna in 1927, was completely unknown so far due to the fact that no copy exists any more and the Austrian film production of the 1920s in general and the director of the film, Heinz Hanus, were of no artistic interest at all. 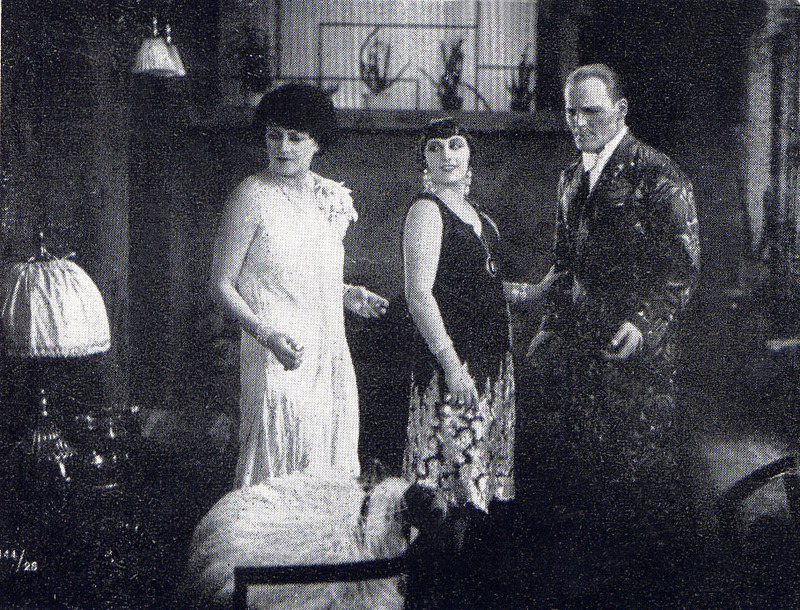 The film opened on November 23rd 1928, although it had been shot already a year before. The press screening a half year later on April 12th obviously served as a test for the hesitating producer. The result was not too promising as two reviews seem to proof. When the movie finally reached an audience another half year later, it got a new title and little or no attention. The information given by two Austrian branch papers are slightly diverse. „Kino-Journal“ reported that Andere Frauen is about „love against nature“. The scriptwriter Franz Pollack is mentioned, but not the fact that the script is based on the novel „Das entfesselte Wien“ (Unbridled Vienna) by Hugo Bettauer, published in 1924. The „Kino-Journal“ gives a different version: „Sonja Gordon, an eccentric and beautiful woman and mother of a charming daughter lives in an intimate relationship with Magda whose beauty has her in its grip. Sonja Gordon who is bent to be a courtesan rather than a mother wants her daughter to marry Sascha Radim, an unpleasant Russian whose ties to the Russian government could help to get back her indebted estates there.“ For social reasons Sonja marries Paul, a man of the world with whom the daughter falls in love. Sonja is in possession of a letter which proofs that Radim is ready to betray his country. To get it back he kills Sonja and Magda. The daughter and the stepfather become a couple. The film and the novel have different focuses on the main characters. In Brettauer’s novel Paul Mautner (called Paul Glinsky in the film) is the center of the story, in the movie it is Sonja Gordon. The reason can be found in the film’s title which speculates with the topic of homosexuality. Andere Frauen should remind of the first movie with a gay story, Anders als die Anderen from 1919, which had aroused great attention. When the producer and distributor lost their courage at the last moment, they changed the title to Schwüle Stunden (Sultry Hours). The word schwül sounds almost like schwul (queer, gay), but nevertheless the new title seemed to be less risky than Andere Frauen. Bettauer who had worked as a journalist in Vienna, New York and Berlin published various novels that described the libertinage and the radical social changes in Vienna in the 1920s in an informative as well as sensational manner. His novel Die freudlose Gasse was brought to the screen in 1925, staring Asta Nielsen and Greta Garbo. In the same year Bettauer was shot dead by a fanatic Nazi. Although Bettauer fought in his novels and magazines that he published for the sexual liberation especially of women and against the „moldy morals of the bourgois“, he described the lesbian women in „Das entfesselte Wien“ as pervert and spoilt. Nevertheless, Bettauer conceded them to be sovereign, strong and independend enough to call the men’s social domain in question and thus raising their irritation and aversion. Lesbian love was not „seldomly“ but never told on the screen before. 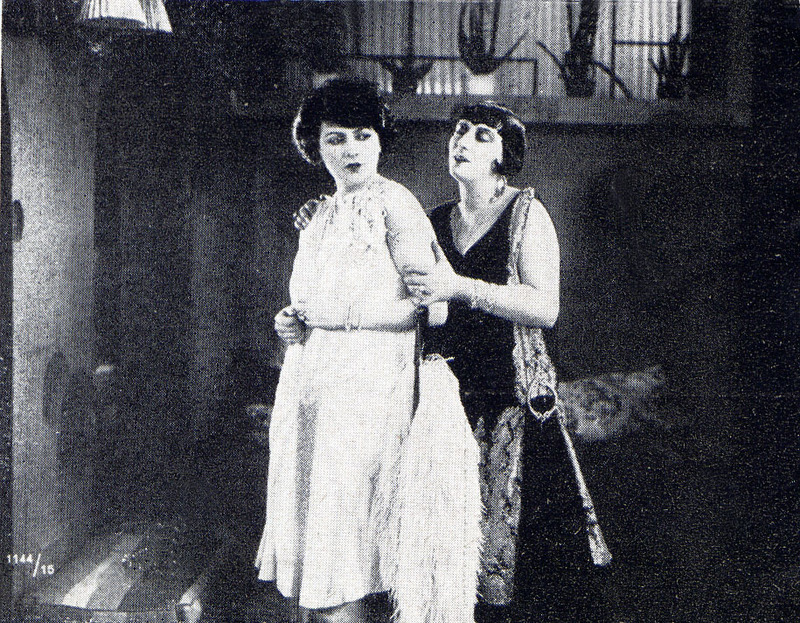 The lesbian women, characterised in a negative manner in the novel, in the movie become the center of the story, what makes Andere Frauen the first lesbian film in film history. The actors are known by name, but their parts in the movie must be guessed. The Italian actress Rina de Liguoro (on the photograph on the right) most probably played Sonja Gordon; the Viennese actress Vivian Gibson (on the left) must have been Magda. The male leading part was played by Oskar Beregi. Heinz Hanus (aka Hanusch), the director of Andere Frauen, became as early as 1935 secretly a member of the Nazi party that was still illegal in Austria then. As the managing director of the Austrian film union he drew up lists of the jewish members of the union. When Austria became part of the German Reich in 1938 these lists were handed to the Gestapo and several hundred people were deported to concentration camps. Whether also homosexuals were among the victims is not known. After the war Hanus was never called for account for his deeds, although they were revealed in 1966. He died as a honored man in 1972.